New OcuSync transmission technology, How does it work? Please post your comments or other questions for all of us to learn this new system. DJI Ken or DJI please comment for us new owners. can you shed some light on this subject please. Is the auto setting not working well for you? Have you experienced interference? I read in the forum that they used ocusync on the mavic specifically for the goggles and in doing so, they sacrificed video quality and the more solid frequency 5.8ghz. But I&apos;m not exactly sure how it was determined. Something about the speed of the video transmission. 3) the 1.4MHz mode (having 38 channels, from Channel 1 @ 2,403.5MHz to Chanel 38 @ 2,477.5MHz, i.e. with 2MHz channel seperation). The duty cycles for the 3 different transmission modes are 85.15%, 84.16% & 10.4% for the 20MHz mode, the 10MHz mode, and the 1.4MHz mode respectively. 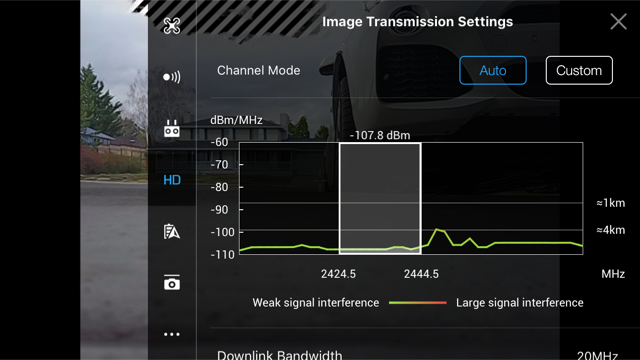 Unlike the Inspire 1 which can only employ 1.2MHz narrow band transmission mode (having 39 channels, from Channel 1 @ 2,404MHz to Channel 39 @ 2,480MHz, with 2MHz channel separation), the Mavic Pro will, subject to initial channel noise scanning result, under Auto Selection automatically choose any of the 3 different modes with the order of priority starting from the 20MHz mode, the 10MHz mode, to the lowest priority 1.4MHz mode; and then automatically switch channels within the chosen mode whenever possible, should channel interference is encountered. 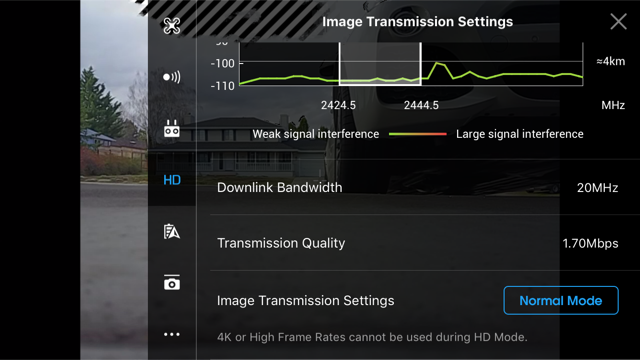 It is the wide bandwidth spread spectrum transmission technology in the 20MHz mode (and to a certain extent the 10MHz modes) combining with the high duty cycle of signal modulation on radio carrier frequencies in the transmission that give the Mavic Pro excellent video downlink performance. These all imply that in Custom Selection, we should as far as possible choose 20MHz mode if there exists sufficiently wide low-noise radio frequency ranges and slide the rectangular box to sit in any of one of the ranges. If there isn&apos;t any wide low-noise range but exists narrower low-noise range, choose 10MHz mode and slide the narrower rectangular box to sit in any of the narrower ranges. If the low-noise ranges exists but are discrete, we had better switch back to Auto Selection and let the Mavic Pro automatically choose amongst the 1.4MHz mode, let the Mavic Pro subsequently choose the 10MHz mode, or the 20MHz modes if circumstances allow it later. Hope my interpretations are correct, and are of help. And hope knowledgeable Fellow Member correct me if any of my understanding is not correct. Thank you for taking the time to explain the differences between the Mavic and Inspire 1 transmission types. I was not implying the Automatic mode was insufficient or not selecting the proper frequency. But mainly curious how it works and in the event I needed to put the setting in manual how to select the best coverage. It sounds somewhat complicated but if I understand you correctly you should leave it in 20MHz mode while sliding the rectangle box to a clear spot if at all possible. Best to you and have a great day. I was not having any trouble with my Mavic and only trying to understand this new technology. Often times using the Inspire 1, you need to switch to manual mode to achieve the best HD downlink.. actually I run the Inspire 1 in manual mode most all the time since FW 1.8. AFAIK these Settings are not available in CE mode (as opposed to FCC mode). People say its easy to enable this Dialog (NOT the higher transmission power !!!) in CE countries, does anyone know how to do that ? You could try changing the phone location setting to USA that&apos;s what we did with Phantom to get extra channels. Can the Ocusync Video Transmission module be purchased to place on other drones? DJI just announced the new Race Edition of the DJI Goggles and they show Ocusync camera and other accessories that will be sold too.